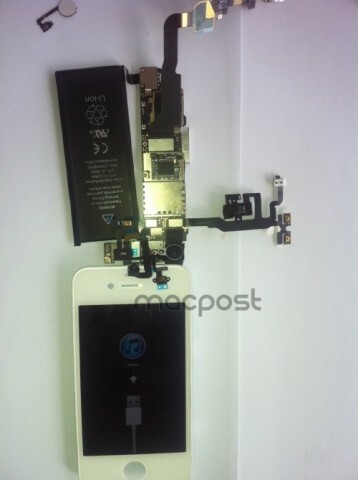 Update 1: MacPost has revealed another new image of a partially assembled iPhone 4S, and mentions it is the other side of the image posted below. 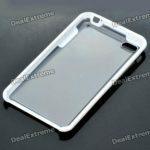 As pointed out by phoneArena, a partially-assembled iPhone 5 photo has been leaked on the web which has been published first on a Chinese microblogging site Weibo. The image claims to give us a glimpse at the innards of an iPhone 5 revealing a logic board with A5 processor, the same dual-core chip used in iPad 2, a larger LCD back panel that apparently runs from edge to edge and a stronger battery of 4.2v, 1430 mAh in place. For comparison, iPhone 4 has a 3.7 V battery which holds 1420 mAh of charge. 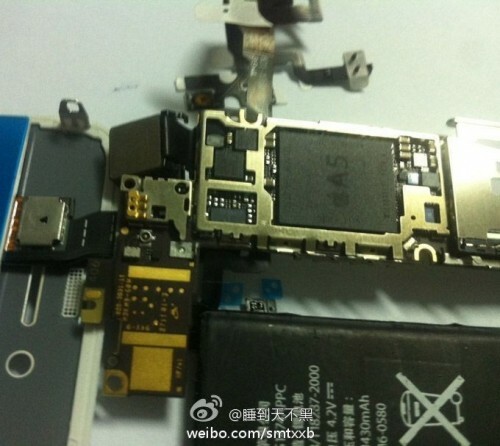 The image clearly shows an A5 chip, which is of course expected for the iPhone 5. There has been some debate, however, about whether Apple will be introducing an iPhone 4-like model that has been unofficially dubbed the iPhone 4S, a redesigned iPhone 5, or both. The battery included in the leaked photo is also generating some conversation, as it appears to be the same model number is seen in previous photos, but carries slightly different specs. This new photo appears to have the charge of 1430 mAh stamped directly on it, but curiously seems to list the voltage at 4.2 V.
Looking at the above picture, notice that the components on the right would actually flip over to the left. Also, some components clearly appear to be missing such as the antenna and a body cage to hold it all in place. Do you think this one could actually be the real deal?